I imagine my paternal grandmother’s kitchen to be very utilitarian, with just a few shelves holding spices and some utensils. A counter-high mud stove with two large openings. A robust fire peeking through, cooking the many meals served in her multigenerational home. On the floor, two cast iron stoves ready to take over cooking duties during the afternoon shift. Today I am the proud owner of one of the cast iron stoves called the ‘Kummati Aduppu’. My mother tells me it is at least 70 years old if not more. She remembers cooking on it as a young bride at her in law’s house. I spotted this stove among the things that were set aside by my parents as they were preparing to sell their home. I did not have the privilege of meeting my grandparents so this will be a cherished connection to them and my past. I imagine my grandmother waking up from her afternoon nap, heading to the kitchen and sitting on the floor in front of the stove. One leg stretched out and the other folded, stoking and fanning the charcoal embers, while preparing the afternoon’s coffee, tea and tiffin. 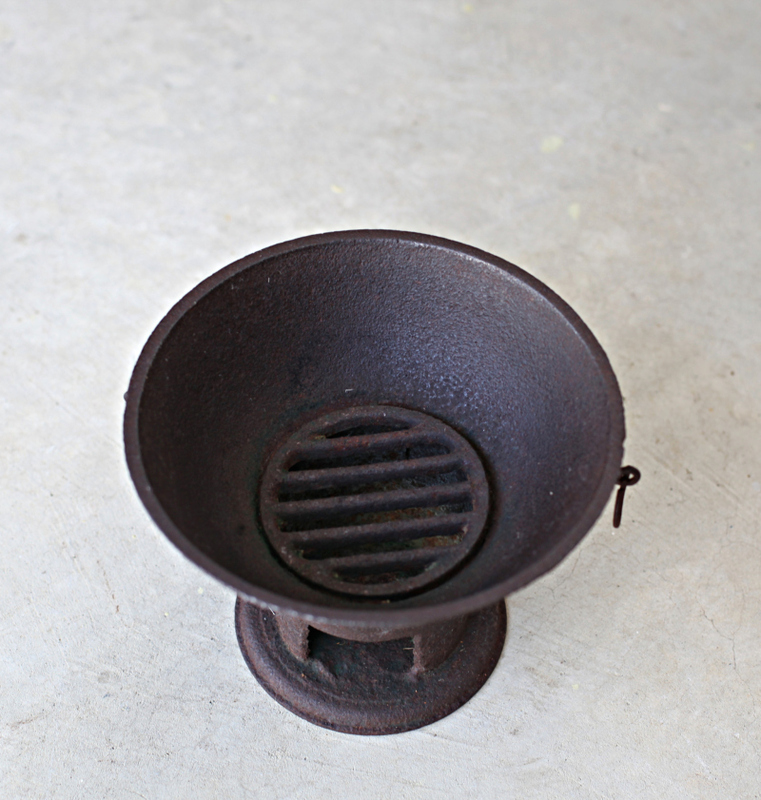 Back in the day, strict rules governing food preparation dictated separate stoves for morning and evening cooking. The fixed mud stove which was fuelled by firewood was the one in which the [Prasadam] offerings for the deities during the morning puja [prayers] were prepared. The lady of the house had to follow strict guidelines of cleanliness in order to prepare the offerings and the day’s lunch for the family. After lunch, the stove was cleaned and smeared with a thin cowdung paste to disinfect it, which sounds rather contradictory but widely accepted as effective. The stove was then usually retired for the day and revisited the next morning. On occasion, if a large dinner was to be prepared, the mud stove was used and the firewood was started again. The process of starting the firewood and cleaning up followed by the anointing with cowdung paste after every session necessitated a smaller second stove for lighter cooking. The free standing Kummati Aduppu was much more user friendly and just right for the afternoon’s simpler fare. In some homes this second stove was housed in a room adjoining the main kitchen and all the afternoon’s activities centered around this room. 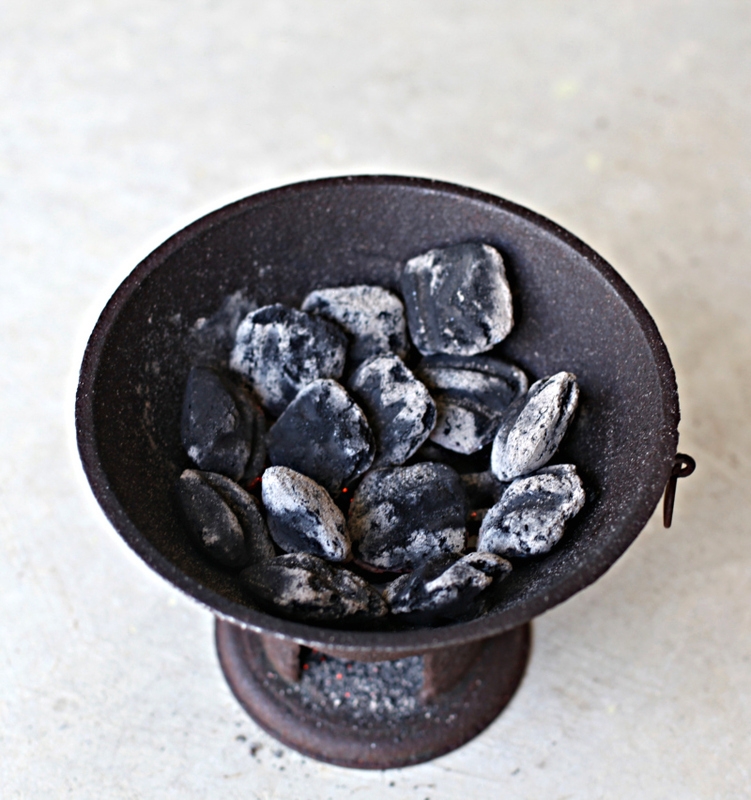 The stove was loaded with charcoal over a grate on the top and ignited with burning paper from the bottom. A hand held fan made of palm leaves was used to fan the flames to light the charcoal. Someimes a long hollow cylindrical metal rod called “ommakuzhal’ was also used to blow air onto the charcoal to help ignite it. The cooking vessel or pan was set directly over the embers. 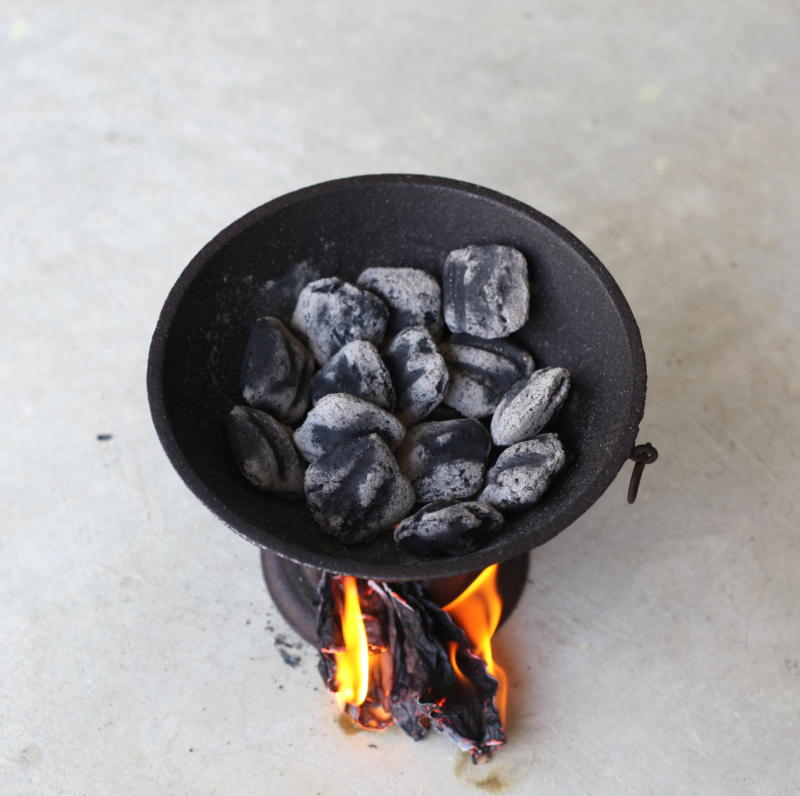 The slow and steady heat from the charcoal was sufficient enough to cook for and feed the large households of that time. 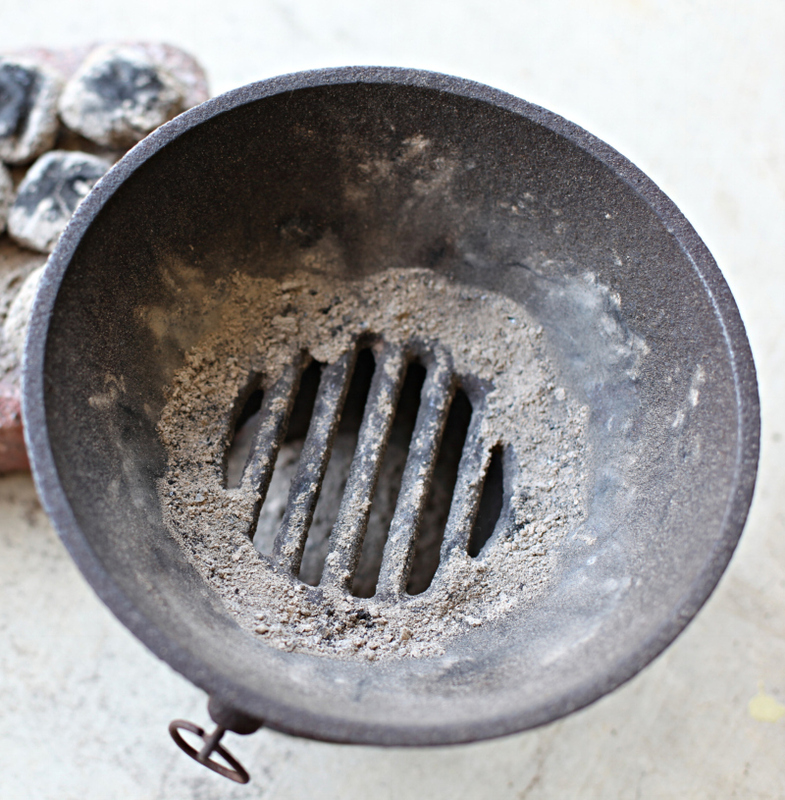 The grate helped with air circulation that kept the charcoal supplied with oxygen and simultaneously allowed the spent ash to fall through. From time to time the charcoal had to be stoked and fanned. Sometimes chunks of dried coconut husk were added as an additional source of fuel. One or two of these stoves were enough to take care of the simpler needs of the families of that time. At the end of the day the ash from the stove was collected and used as a scourer to wash pots and pans. The left over charcoal was washed [so my mother remembers] and dried to be used again. Every night the Kummati Aduppu was scrubbed clean and put away till the next afternoon. Every night kolam, little designs made with rice flour, were hand drawn on the big mud stove, so that a clean stove with auspicious symbols greeted the person coming in to the kitchen the following morning. And so it went till both stoves faded into history. Now one of them is getting a new lease of life…. Wow very nice write up. Will show my daughter to read this. My dad prefers some dishes to be prepared in this kumuti aduppu even after my mom started cooking with gas stove. Wondering the awesome work of our grandmoms. I have heard that people used to food prepared in this stove swear by the special taste. It is probably the nostalgia associated with it or perhaps the slow and steady method of cooking. Such an interesting history behind this piece. I love objects full of character and this sure is one of them. I find the practice of using it fascinating – cowdung and “strict guidelines for cleanliness” are indeed somewhat counter intuitive, but many such customs surface now as truly ingenious, so I’m not surprised at all. Lovely that you’re able to use it again. Me too, I am planning to grill corn on it. We Still Use This Kind Of stove In my Native Dominican Republic We Call It “Anafe”! Thanks for the info, I am fascinated by practices and customs that are similar in different parts of the world. I was looking up the history of such stoves,close adaptations are being used in Africa and Cambodia even today. Great to know also in D. Republic. What a wonderful post! Sometimes we take our lifestyles and all their modern trappings for granted, but learning about how different things are in other places or were in other times puts it all in perspective. Thanks for sharing this. What a lovely story and how lucky you are to have inherited this wonderful stove. I love these types of items, if you ever get fed up with it, pls send it to me. Well there is a second and a larger stove that my mom is holding onto and I want that one too! What a jewel of tradition behind this stove! How much our focus has changed. We might consider that gas or electricity are progress, and they do make many aspects of life easier, but there is a loss in consciousness. The attention to details, selfless consideration and cleanliness are gone. All of them mold character and attract higher values. And makes you more patient for sure! Lucky you to have got that traditional stove. Beautiful! Traditional stove looks so divine. I’m seeing your blog for the first time. It’s wonderful! Welcome, Kum. Thank you for your kind words. Lovely post Sandyha! are you well dear? you haven’t posted for so long! I loved this post Sandhya. We did not have these, there were smaller sized wood -fire stoves on the side. You have a lovely blog, Shri. Thanks for dropping by. Wonderful! 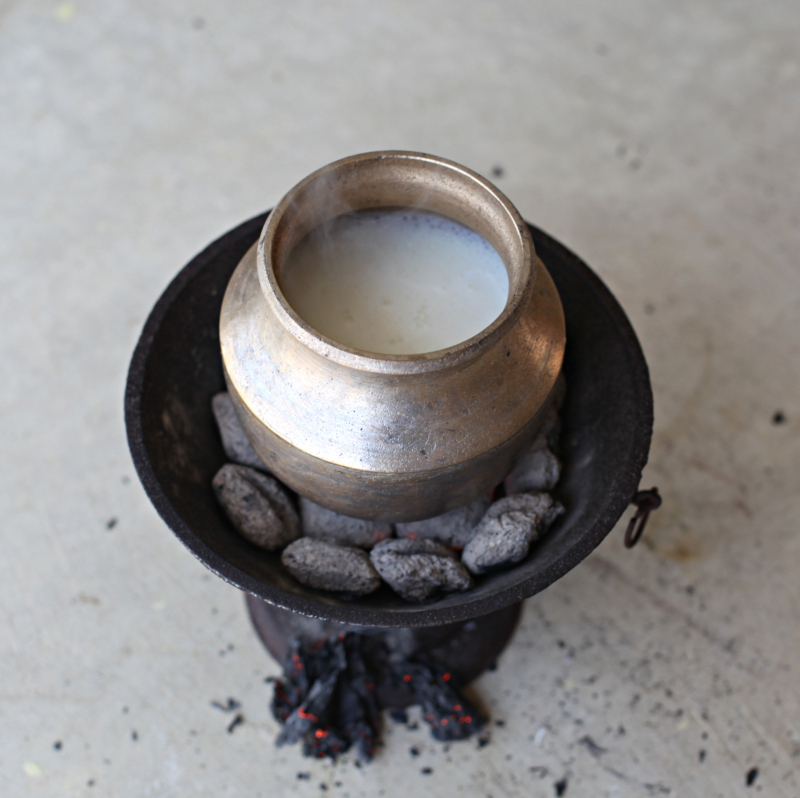 As a kid, I remember my mother boiling milk on a kumuti stove. She’s now 90 and says she had four of them when she was young, but slowly gave them up in the 50s when she had a primus (pumping stove) and a multi-wick kerosene stove that were faster. And then in the 60s, cooking gas was available (Rs 6 a cylinder). I still retain one of those cast iron stoves and charcoal. Going to roast brinjals one of these days! The aduppu is one of my most treasured possessions. It does a wonderful job with anything I’ve attempted to cook. It is a miracle the aduppu survived. As I found out, my mother didn’t really mean to safe keep it. It just sort of survived, hidden under all the debris that accumulates in our modern lives only to be discovered during their move while I happened to be there! Lucky me.